Why hasn’t Bernie Sanders endorsed his son’s run for Congress? Levi Sanders, candidate for US Congress in New Hampshire. Senator Bernie Sanders has traveled to Iowa and narrated a 30-second ad to endorse one congressional candidate and journeyed to Allentown, Pa., on behalf of another. He publicly backed a mayoral candidate in Omaha. But while he’s busy endorsing politicians across the country who share his liberal values, Sanders is taking a noncommittal stand closer to home when it comes to his own flesh and blood. Sanders has refrained from endorsing Levi Sanders in his only son’s campaign for the Democratic nomination for a New Hampshire congressional seat. The Vermont senator and former presidential candidate — who has an ardent following in New Hampshire, where he defeated Hillary Clinton in the 2016 Democratic primary — also has not encouraged his legion of supporters to help Levi Sanders. He hasn’t even traveled to New Hampshire since his son announced he was running in February. The father is acting as if the son’s campaign barely existed, making for an awkward political story line for a family that shares its ultraliberal lineage right along with the DNA. It is especially strange because Levi Sanders has been a constant presence in his father’s political life, from sitting on his lap as a 2-year-old during Sanders’ first run for public office, to following him around the country during the senator’s 2016 presidential campaign. Levi Sanders seemed to take his father’s firm stand on the sidelines with good humor when contacted by the Globe this week, but he was hardly expansive on the subject. “You know I’m not Bernie’s son. I’m the son of Larry David’s fourth cousin,” he quipped in a brief conversation, referring to the distant blood tie between the comedian and the senator. He initially agreed to a more extensive interview on Tuesday night but then canceled it and has not responded to numerous messages left with him and his campaign associates. Bernie Sanders – whose tepid statement after his son announced his campaign was notable for its lack of endorsement – provided a statement to the Globe highlighting Levi Sanders’ support for raising the minimum wage, rebuilding infrastructure, and making public higher education free. Aversion to dynasties aside, New Hampshire observers speculate that the real reason Bernie Sanders has not weighed in on his son’s behalf is that Levi Sanders is running what most in the state consider to be an inept campaign – and Bernie Sanders doesn’t want to be damaged in the run-up to a potential 2020 campaign of his own. “Nobody I know is really considering Levi as an option,” said former state senator Burt Cohen, who was Bernie Sanders’ first prominent endorsement in 2016 and is backing a rival of Levi Sanders. “No, it’s actually worse than that: I don’t hear anyone even bringing up his name. People aren’t sure why he is running. If Levi thought he could just transfer the enthusiasm from his father to himself, well he is learning that is just not happening at all. Levi Sanders, 49, does not even live in the First Congressional District – which, while not a legal requirement for running for a congressional seat, is often a political necessity. From his home near the Vermont border in Claremont, N.H., it takes over an hour to even enter the district. He commutes to Cambridge, where he works as a senior legal analyst helping clients who have been denied federal benefits such as Social Security Disability Insurance. His limited personal experience as a politician includes a bid for Claremont City Council about eight years ago, which he lost with a seventh-place finish in a field of nine. Levi Sanders is in a crowded field of nine Democrats and three Republicans, all vying to fill the seat being vacated by Democratic incumbent Carol Shea-Porter. The district, which covers a swath of the eastern part of the state and includes Manchester and Portsmouth, has been among the most volatile of swing districts in the country. Donald Trump barely won the district in 2016, and so did Shea-Porter, who has endorsed her chief of staff in the race, Naomi Andrews. Sanders had raised only $11,500 by March 31, according to the most recent filings with the Federal Election Commission, while one of his campaign rivals, Maura Sullivan, had raised nearly $1 million. 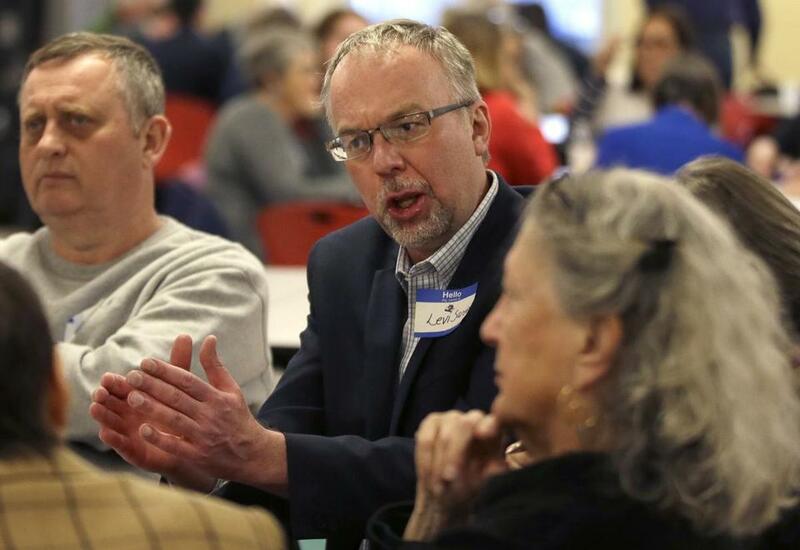 Twice over the past week he has been the only no-show for candidate forums, and a survey conducted in mid-April found that 82 percent had never heard of Levi Sanders. Still, there is time before the September primary. But Bernie Sanders’ decision not to weigh in has played a role in dampening support for his son, several longtime political observers say. If his own father isn’t backing him, why should voters? Last month, when Bernie Sanders had a conference call with the dozens of people on his New Hampshire steering committee, he thanked them for their work in 2016 and said it was crucial that they get involved in upcoming midterm elections. He never mentioned Levi’s campaign. Levi has two endorsements: New Jersey Governor Phil Murphy and Representative Ro Khanna of California. Levi is Bernie Sanders’ only biological child; he also has three stepchildren from a previous marriage of his wife, Jane. His stepdaughter, Carina Driscoll, ran an unsuccessful campaign for Burlington mayor; she also did not have an explicit endorsement from Bernie Sanders. Levi Sanders’ campaign website does not mention his father. The main page does include a photo, but in it his father is walking away from him, only recognizable by his slumping posture and white head of hair. The website does not allude to his family, but his campaign text could have easily been written by the elder Sanders. Matt Viser can be reached at matt.viser@globe.com. James Pindell can be reached at james.pindell@globe.com.